It is made by a natural culturing and controlled fermentation process with tempeh starter, that binds soybeans into a cake form, similar to a very firm vegetarian burger patty. Tempeh is unique among major traditional soy foods in that it is the only one that did not originate from another cuisine. It originated in today's Indonesia, and is especially popular on the island of Java, where it is a staple source of protein. Like tofu, tempeh is made from soybeans, but it is a whole soybean product with different nutritional characteristics and textural qualities. Tempeh's fermentation process and its retention of the whole bean give it a higher content of protein, dietary fiber, and vitamins. It has a firm white texture and an earthy flavor which becomes more pronounced as it ages. Because of its nutritional value, tempeh is used worldwide in vegetarian cuisine, where it is used as a meat analogue, and contains the needed vitamin B-12 which is produced natural due the fermentation process. Tempeh begins with whole soybeans, which are softened by soaking, and dehulled, then partly cooked. Specialty tempehs may be made from other types of beans, wheat, or may include a mixture of beans and whole grains. A mild acidulent, usually vinegar, may be added to lower the pH and create a selective environment that favors the growth of the tempeh starter mold over competitors. A fermentation tempeh starter containing the spores of fungus Rhizopus oligosporus is mixed in. The beans are spread into a thin layer and are allowed to ferment for 24 to 36 hours at a temperature around 30 C (86 F). In good tempeh, the beans are knitted together by a mat of white mycelia. Under conditions of lower temperature, or higher ventilation, gray or black patches of spores may form on the surface-this is not harmful, and should not affect the flavor or quality of the tempeh. This sporulation is normal on fully mature tempeh. A mild ammonia smell may accompany good tempeh as it ferments, but it should not be overpowering. In Indonesia, ripe tempeh (two or more days old) is considered a delicacy. Our tempeh starter is design to process less black spores, in order to give it a nice appearance. .. Typically you buy TEMPEH ready-made, even in Indonesia. And if you live there, buying it is like hunting for a loaf of bread; it is widely available, cheap, and most importantly, freshly produced. And since it has a savory taste and dense texture, it easily replaces meat which is typically very expensive. Abroad however, you'd be hard pressed to find fresh TEMPEH anywhere. It's only available in a frozen state at Asian markets. These frozen blocks are a decent substitute, but only until you've had a freshly made batch of tempeh. Now you can make your own Tempeh, just order our Tempeh Starter , we include clear instructions. Shipping is reasonable cheap, and soon you will be eating your own tempeh. Tempeh is made by a natural culturing and controlled process that binds particles into a cake form. It originated in , where it is most popular, although it is common in other parts of as well. It is especially popular in Indonesia, where it is a source of protein. Like tahu or toufu, tempeh is made from soybeans, but tempeh is a whole soybean product with different characteristics and textural qualities. Tempeh's fermentation process and its retention of the whole give it a higher content of taste and vitamin B12, and compared to tofu, more firmer and stronger . Because of its nutritional value, tempeh is used worldwide in vegetarian dishes. Our starter kit produces more then 10 Lbs of Tempeh, prices, and S&H, are the best! A byproduct of making soy milk is called Black Oncom, for which also a certain starter required. In order to make Oncom, you have to make Soy Milk first from Soybeans, so the soy bean milk is for free!, and the residu is used to produce Oncom, we show you how to do it. Oncom more recently referred to as onchom, one of the staple foods of Indonesia, and is a culture food-product closely related to tempeh. Onchom is more commonly produced in West Java, Indonesia. 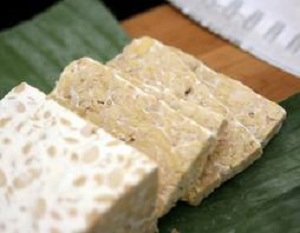 Unlike tempeh, onchom is mainly prepared soy bean fiber (Okara Japanese], a byproduct of manufacturing soy milk. A mold species, is used in the short fermentation of onchom. In contrast to tempeh, sporulation of the oncom mold is encouraged in onchom production. 1 package Black Oncom Starter is enough to make 6+ lbs delicious Black Onchom, instructions included. 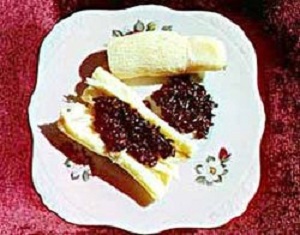 Most Tape or (Ketan Tapai ) is made from fermented glutinous black rice, or from cassava (in the community of West Java more familiar as the fermented cassava peuyeum), while in East Java it is more often referred as uhung tape. Tapai known in Asia also as fermented sticky rice. We offer Debit,Credit Cards,Paypal Payments, Western Union/MoneyGram at checkout. Our Tempeh Starter stays potent for months and years! Shipping starts at $3.95 depending on location Visit our F.A.Q. section for more Information and Questions. How to make homemade Tempeh? We provide clear instructions how to use our tempeh starter, and make perfect white tempeh in no time. Do not spent a fortune in Healh Stores, make your own tempeh at home now !